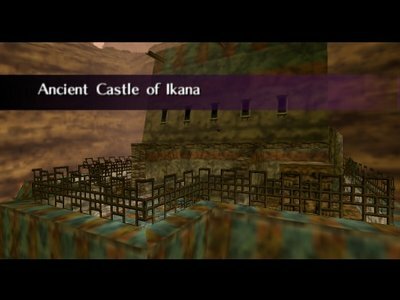 The Ancient Castle of Ikana is a mini-dungeon which needs to be completed before you can attempt to clear the Stone Tower Temple. The Castle itself is located on the upper ledge of Ikana Canyon. Use the well to get a Mirror Shield and you can enter the castle via a small well that is connected to backyard of the castle. The other entrance can only be used if you have a Mirror Shield or Light Arrows. It is next to the main gate and can be opened by removing the Sun block, by either reflecting a sun’s ray on it or shooting it with a Light Arrow. Once inside you will have to get to the balcony outside and place a Powder Keg on the crumbled section to shine light into the castle. (During daytime of course) Use this ray of light you can remove the last Sun Block in order to get to Throne Room where the king and his nameless servants are waiting for you. After defeating them you will learn the Elegy of Emptiness. The castle served once as the seat for the government of Ikana. Back in those days the castle had many soldiers that formed Ikana Army all under the command of Captain Keeta. This was mainly from a group of spies from an enemy nation who were send out to spy on Ikana. These spies are also known as the Garo, with the Garo Master as their leader. The two composer brothers Flat and Sharp also served the royal family of Ikana, but after the kingdom fell Sharp got cursed. In that state he locked his brother Flat in one graves of Ikana Graveyard. Sharp went to cavern at the beginning of the riverbank, that mysteriously dried up shortly after. The destruction of Ikana was partly due to their own doing. Igos du Ikana tells you that the quarreling of soldiers within the castle started this. Not being able to forgiving each others failings and the lack thrust in each other. This created a bad climate, which meant the end of Ikana. The composer brother tells you about the trick of the “masked one” to set them up, which started the downfall of the kingdom. This masked one he speaks about could very well be the Skull Kid. After Ikana Castle was destroyed it was rumored that the king is still haunting the throne room. Nowadays the castle still stands tall in the landscape even though the wear and tear of time itself damaged the castle severely. It is now filled with spirits in the form of Garos, Gibdos and Redeads which are unable to forget their living days and still haunt Ikana. Also the soldiers of the castle turned into Stall Children, but even after all this time they still obey to the command of their captain: Skull Keeta or someone who resembles him using the Captain's Hat for example. The Redeads inside the ruins react on the Gibdo mask, Garo’s Mask or the Captain’s Hat. They start dancing as soon as Link dons one of these masks. This is so because they appear to be members of the Castle’s dancing troupe before they died. The Lackeys of the king turn out to be young men actually, which means that they start dancing when you start marching using the Bremen Mask. It is quite funny seeing them jump around. They might actually accidentally step into the sun’s rays, which makes it easier to take them out. upon me. It is all thanks to you. one who had upset things. one who will break the curse. ...I have made my final request. The French and German translations here is a little different, it’s more like: “Ruins of the Castle of Ikana” and “Ruins of Ikana” respectively. This page was last modified on 11 February 2006, at 12:22.